Compatibility: Requires iOS 10.6 or later. The fire loop in only about 20-30 seconds long but it looks great on my retna display and it’s well worth a buck. Just notice a tiny piece of wood falling down then dissaperaring every few seconds. Maybe they can redo the loop so at least nothing moves in the brick scene. Developer, I think updating so the mouse doesn’t activate the huge menu with every little bump would be a great addition. Maybe more menu based actions? I purchased this about 3 months ago. Now it only shows a white screen. 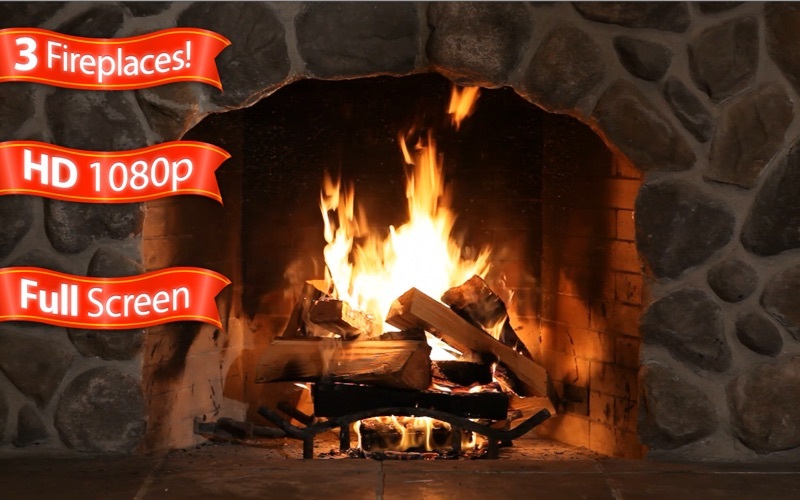 There is sound but no animated fireplace. I really enjoyed this app as I would mirror it to big screen via Apple TV. I have completely uninstalled and reinstalled twice but still has the same problem. I have emailed support 3 times and get no response…..
Bought this app today and installed it on my Mac (OS X 10.8.2). Disappointingly it does not work, i.e. does not start any movie. DO NOT BUY THIS APP! 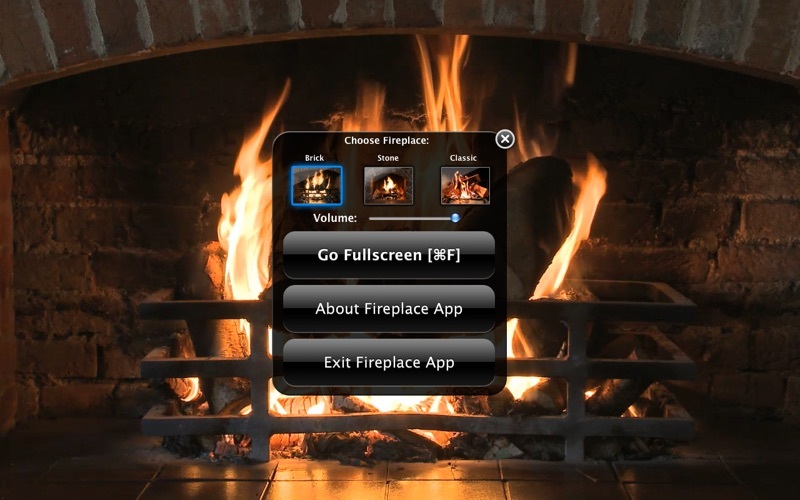 There are alot of fireplace apps out there, and I've downloaded half a dozen of them over time, but this one caught my eye. yeah, it doesn't look like much, and you only get 3 visuals, however it really doesn't matter. Clarity is a big game changer when vewing any app on a large monitor. 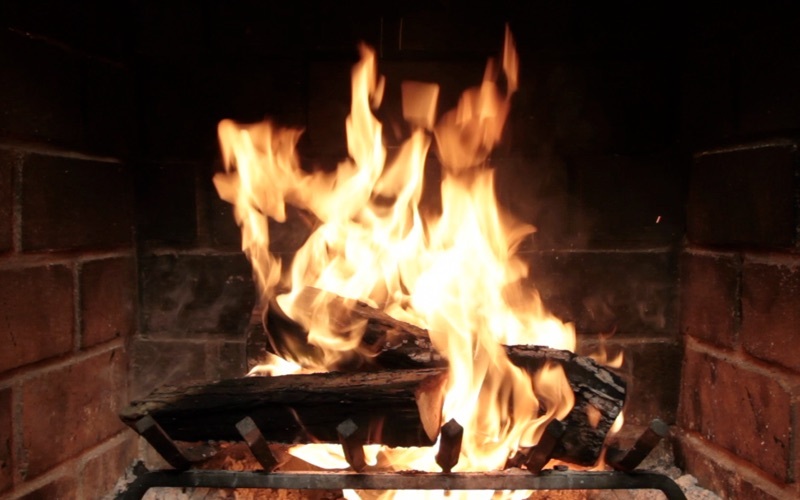 The 1080p video qualty is what a fireplace app should be and this one delivers. Not bad for .99. heck not bad for a few more dollars. If what you are looking for is a visually stunning, picture perfect mood changer, than give this a try. like I said, "small package, great delivery"
I love to use this app when I'm stuck on writing something. Great way to lose yourself and collect your thoughts. Worth the price. Huge dialog box in the middle of the screen will NEVER go away. I bought the paid app thinking that it was an issue of the free app, but no. The dialog box is there to ruin the effect forever, in all modes. I have to agree with another reviewer that it could be better...a lot better. This was my first app store purchase, and I continue to love it, and am impressed by the updates offered periodically. It does make my fan run, but is so pretty and relaxing, I can forgive that. Hats off to the developers on this one!